I have always been inspired by St. Francis and all that he represents. St. Francis lived his life with joy and appreciation for all things created. I’ve always been a great animal lover myself. 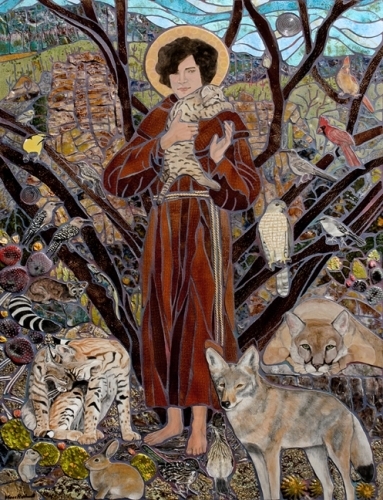 I had an “artistic vision” of St. Francis surrounded by the beautiful animals and birds of the desert Southwest. I wanted to show the calm and peace the animals might feel while in the presence of Francis. The beautiful Sabino Canyon and the blue Arizona sky are the background of my mosaic. I made all of my own tiles. I painted the tiles of my birds and my lizard “Marco” using my photographs. I spend many hours a week observing, training and photographing my birds and lizards in my garden. We have developed friendships. Some of them can be seen in my Wildlife Gallery. The background tiles have the texture of rock and vegetation. After the tiles were fired, I cut every mosaic piece from the glazed tiles, attached them to the base and finished the piece with many colors of grout. My inspiration for the two Bobcats and the Coyote came from photos taken by Sam Angevine, www.samangevine.com. Sam has taken some of the most amazing photos of wildlife in the Tucson area. He has allowed me to use the images in his photos for my models. The roadrunners in the foreground, “Bella” and “Edward”, are little feathered friends of artist Geri Niedermiller, http://gekkosworkshop.5thelement.com . Bella and Edward are quite the characters and frequent visitors to Geri and her husband.